I've got a funny story for you. I arrived at Macy's early last night to get a good spot for the fashion show, but after looking around everywhere it was clear they didn't have anything set up. I ended up asking 4 different employees and one finally called a manager over. They all had the same story- the fashion show was the previous night (the 6th) and the PR agency must have gotten the date wrong. The press release and even Macy's own website (you can't see it online anymore since the date has passed but I have screenshots) showed the date as the 7th. I'm really disappointed that I didn't get to see the show, but I do have some fall fashion inspired nails to show you anyway. These are based on my favorite fall outfit. 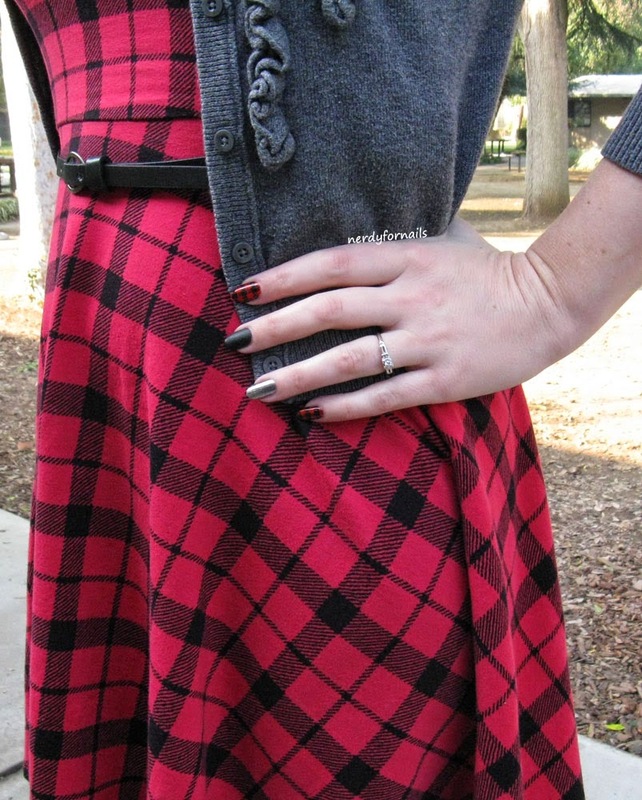 I took my inspiration for the plaid nails from my red dress and a little logistical help from the amazing Chalkboard Nails. 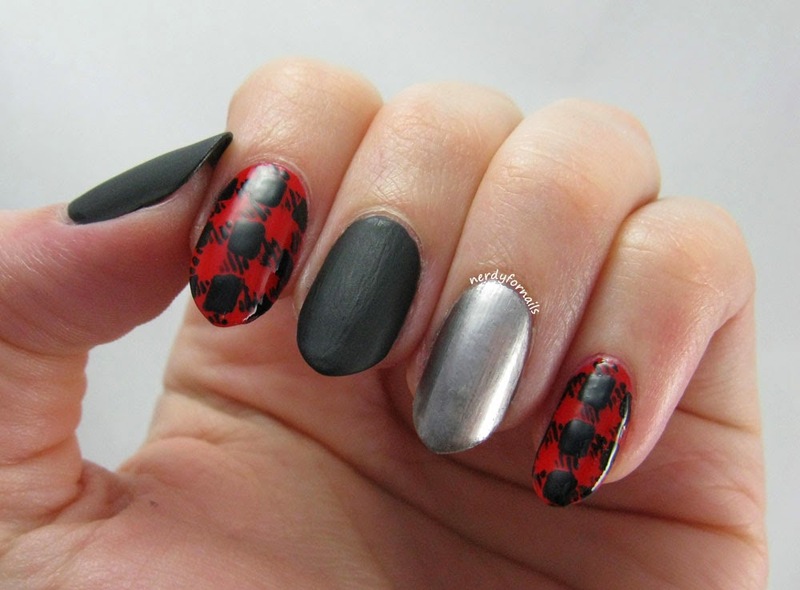 I started with two coats of a nice bright red color from See San (a bottle I picked up in Thailand) and then hand painted black squares and tiny lines using a small nail art brush and Sinful Colors, Black on Black. I used Sinful Colors, Whipped from their matte line for the leather inspired nails and then topped them off with Wet n Wild, Matte Top Coat for extra matte-ness. The shiny silver nail is a base of China Glaze, Recycle which I covered in Pewter nail foil from Dollar Nail Art. 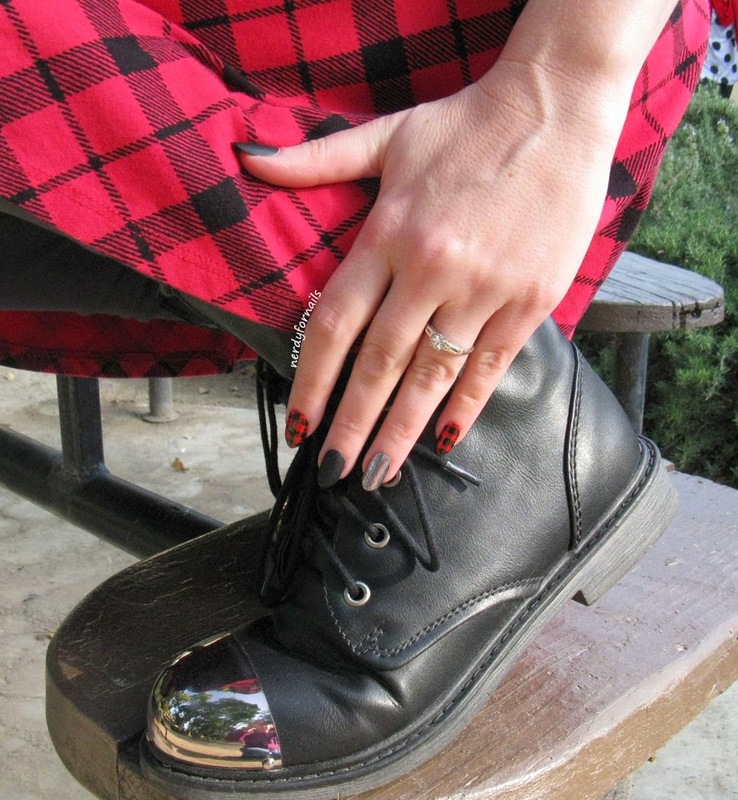 The leather and shiny nails perfectly match these boots that I would be completely in love with if they weren't too tight and incredibly uncomfortable after about five minutes. I need to work on stretching them out so I can actually wear them all day without wanting to throw them across the room when I get home. Since I didn't get to see the fashion show I'm going to troll the internet for more fall looks to base some nail art on. What fall trends are your favorites? I can't get enough boots with legging and skirts.